I didn't know Jason Giambi was a teenager. The question is how many people are really going to be able to pick out the real message of this billboard? Is it to simple? i think it's right on the money... you have the two images to connect the copy w/ the message. i like it. short, simple, and sweet. Definitely a retro look, combined with a retro (but cute) joke. 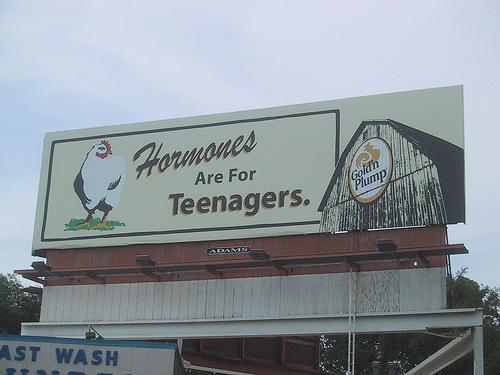 Something I really like is they resisted the temptation to stick in a tag line like "100% Hormone Free Chicken", and assume the viewer just might be bright enough to figure that out. I like it - I'm sick of all ads being dumbed down to the lowest common denominator, which is pretty freaking low. 'Unhipsterized'? What does that even mean? I think these are lame.. I am in the market. They have many different billboards. I think most of the different executions are too simple and the billboard doesn't stand out enough. The script... the stange looking chicken... i dunno. It is all very blah. I have to politely disagree. These are some of my favorite boards in town right now. The simplicity is what I appreciate the most and I think it's one reason people are noticing them and retaining the main messages. Although...I would guess that women are the main target, so I'll have to ask the wife.